The aim of the 3D modelling is to verify the geological knowledge on the basis of an existing gravity survey. 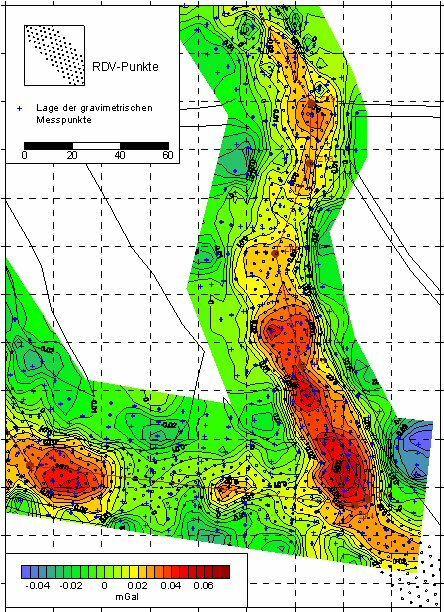 For this purpose, the gravity effect of the developed geological model was calculated using the program GRAV3D (self-development) and compared with the measured data. The differences should be used to derive further investigations for the improvement of the geologic model. The example shown here originates from lignite exploration. The existing 3D geological model was mainly developed on the basis of drilling information. It is built of layers that have bulk densities differing from the mainly occuring sand (that means coal seams, boulder clay, pre-Tertiary layers). For the gravity modelling the layers are divided into rectangular prisms. A density is assigned to each prism and the gravity effect is calculated relative to the surface. Fig. 3 shows the comparison between the measured gravity field (A) and the calculated gravity field derived from the geological model (B). It can be seen that the modelled gravity field is matching the measured field already well. Picture C of that figure shows the difference of measured field (A) minus modelled field (B). Here, the differences between the modelled and the measured data are shown more clearly. The interpretation of these differences will give some indication for the improvement of the geologic model. On the basis of this interpretation the geological model can be improved in the area of the greatest differences by applying appropriate measures (e.g. further drillings). The success of the improvement can again be controlled with another modelling.